THE MONKEY3 story starts in Lausanne (Switzerland) as a jam-band community influenced by a psychedelic and Stoner Rock vibe reminding of PINK FLOYD, BLACK SABBATH or LED ZEPPELIN. Their debut album comes out in 2004, and nine years later they are releasing their fifth album symbolically named “The 5th Sun”. The album brings six tracks. That`s all… Six tracks build up with psychedelic, one better than the other. And the best part… They`re all instrumentals, so there`s no chance in getting disappointed by the vocalist. Industrial like beginning marks the second track “Suns”. It`s more ambient track than the previous one (think VANGELIS, but with guitars instead Tubular Bells). The bass carries the structure of this track, while the other instruments accompany. But then, somewhere around the middle, the guitars come in, bringing the overwhelming heaviness of sound. As in previous track, the sound escalates near the point of exploding, but managing to keep it together, and slowly bringing it down as the ending of track comes. “Birth of Venus” comes crushing in, later getting slower rhythm, for a while… The guitars rule this track, with extremely great drumming accompanying. “Pintao” opens with echoing guitar riffs, and drums that sound like a war call… Keyboards are adding some more mystery (not sure why, but this track reminded me of Doctor Who(?!?) or if you`re familiar with its soundtrack “The Doctor`s Theme”, and a bit to “Immigrant Song” by LED ZEPPELIN). “Once We Were” is the fifth track, one of the longer ones, with more guitar oriented sound, more walking on the Metal side with incredible guitars… “Circles” are the final track, closing this incredible album. 70`s oriented sound dominates this mid-tempo track. As usual, guitars are there to add certain heaviness to the sound. Perfect track to round up this release. 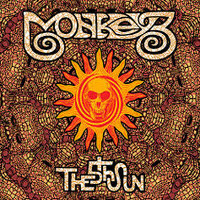 MONKEY3 brings the fresh sound (not so fresh by originality) showing that Metal instrumentals doesn`t need to be extremely heavy, or extremely symphonic. They have a bit of everything, packed well, forcing you to listen to the album more than once… And still after many listens, you`ll still be able to find a new sound that hasn`t been there previous time you listened to the track. MONKEY3 is something you most definitely need to hear, and they need to make collaboration with APOCALYPTICA (that would be a killer of a song, or an album… just throwing some ideas here…).